You can set REPEATING WEEKLY PREFERENCES for when you like and dislike helping and also set DATE-SPECIFIC PREFERENCES for any special days. 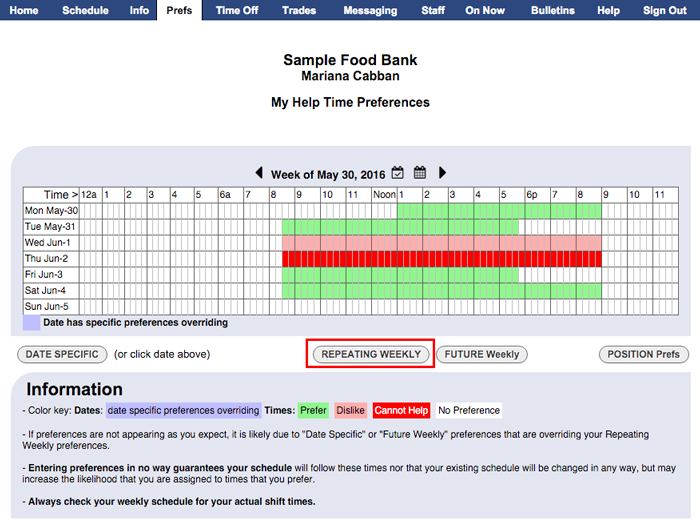 After entering your REPEATING WEEKLY preferences, you can set any needed SPECIFIC DATE preferences. In the top menu, choose Prefs to go to your Help Time Preferences page. Click the "REPEATING WEEKLY Prefs" button. You will see a grid where you can "paint" colors to indicate when you like and dislike working. To change a whole row's color at one time, click the name of the day in the left column. Click the Save button when done. If your Repeating Weekly Preferences will change in the future, you can click the FUTURE Weekly Prefs button at the bottom of that page to change them. Set the date to begin using the new set of Repeating Preferences. Be sure to click Save after making any change to a page. After setting your Repeating Preferences, you can click on any date to change that day or click the SPECIFIC DATE Prefs button. 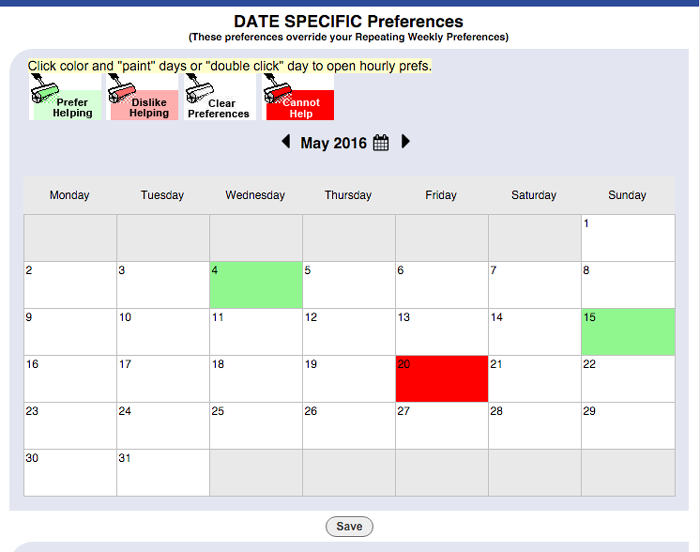 This allows you to set whole days or partial days to your special preferences for that day. 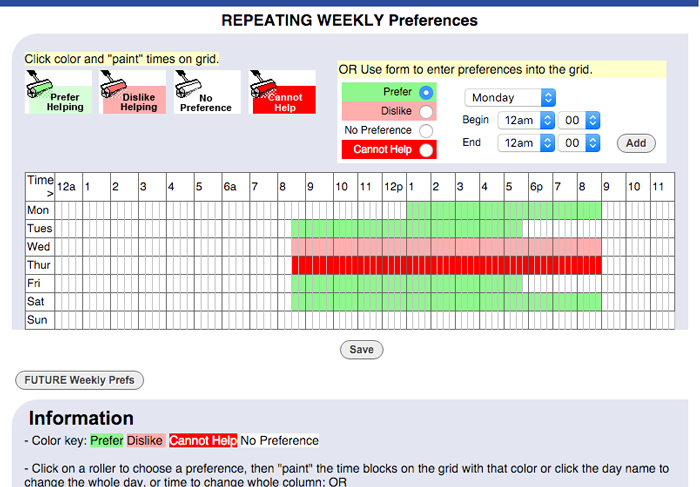 To set a whole day preference, click on a roller and CLICK ONCE on a day or "PAINT" multiple days on the calendar. 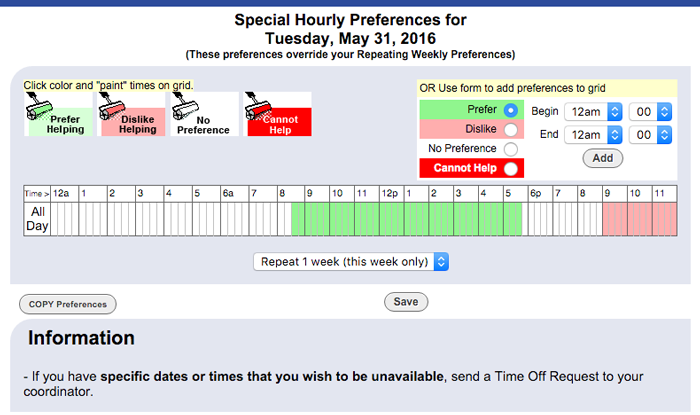 To set specific hourly preferences for a day, DOUBLE CLICK the day to edit. Note: If you set hourly preferences on a specific day, you can also choose to repeat those preferences over a number of weeks (up to 10) before clicking the Save Changes button.